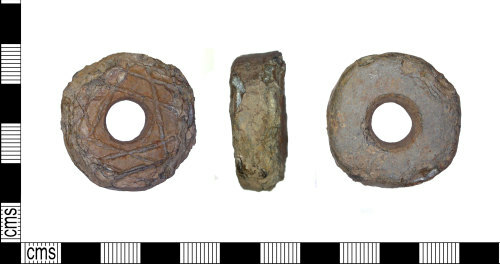 Early medieval/medieval lead alloy spindle whorl, 22mm in diamater and 10mm thick with a weight of 50.26grams. The object is circular in form and rectangular in cross section with a central circular hole, 10mm in diameter. The object is decorated on one side with a series of raised straight lines, in groups of at least two running parallel, which are arranged running in four directions around the central hole, so that they cross over each other.